Crunchy, tangy, crisp, creamy, citrusy, vibrant, delicious. I’ve said it before, and I feel compelled to say it again: these tacos are speaking my food-love language, and I just can’t quit them. This recipe quickly staked its claim as one of the most adored on my blog, and it’s been known to win the affection of everyone from meat-loving adults to cauliflower-fearing kids. 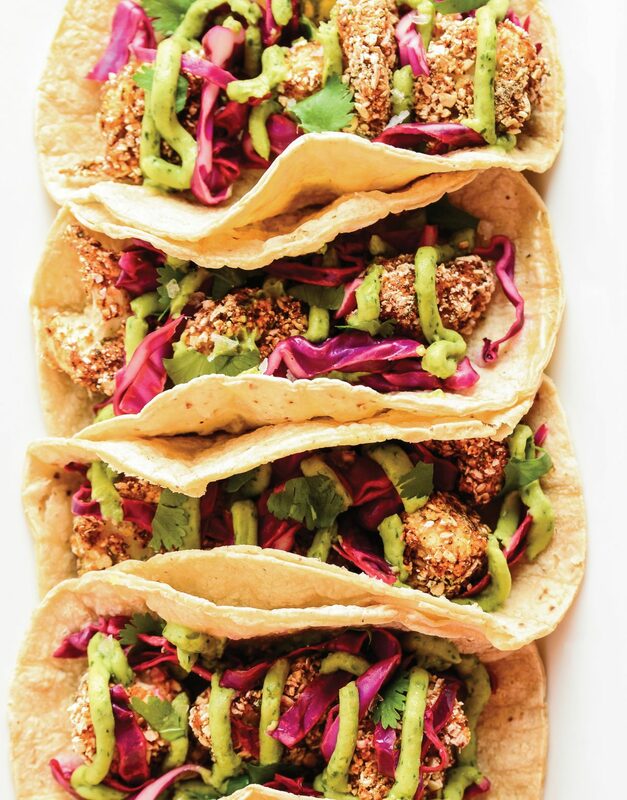 Battered, seasoned, and baked crispy cauliflower florets are tucked into warm corn tortillas, topped with a tangy purple cabbage slaw, and drizzled with avocado cream. The final touch is a splash of fresh lime juice, and then it’s time to bite, savor, and repeat. Preheat the oven to 400˚F. Line a large baking tray with parchment paper. Add the rolled oats to a food processor. Pulse 75–80 times, or until a coarse meal forms. The texture should be similar to panko bread crumbs. Transfer to a large, shallow bowl, and whisk in the cilantro, chili powder, sea salt, paprika, cumin, garlic powder, turmeric (if using), and cayenne pepper. In another large, shallow bowl, whisk together the almond milk, brown rice flour, and lime juice until smooth. From left to right, line up the cauliflower florets, almond milk batter, oat crumbs, and baking tray. Place a handful of cauliflower florets into the almond milk batter, toss to coat, shake off excess batter, and transfer to the oat and spice mixture. Toss to coat and transfer to the lined baking tray. Repeat with the remaining cauliflower. Bake for 25–30 minutes, or until crisp and light golden, tossing halfway through baking. Remove from the oven and let cool slightly. While the cauliflower is baking, add the purple cabbage, lime juice, apple cider vinegar, maple syrup, and sea salt to a medium nonreactive (i.e., nonmetallic) mixing bowl. Toss to coat and set aside, stirring occasionally. Add the avocado, cilantro, lime juice, and sea salt to a food processor. Process for 3–4 minutes, or until smooth. The texture should resemble mayonnaise. Heat the tortillas, one at a time, in a small skillet over medium heat for 20–30 seconds per side. Fill each with 3–4 pieces of the cauliflower, a small handful of cabbage slaw, and a dollop of crema. Garnish with cilantro and serve with lime wedges to spritz the tacos. Refrigerate leftovers in separate airtight containers for up to 3 days. The Avocado Crema is best when fresh. No Nuts? No Problem | To keep this nut-free, swap out the unsweetened almond milk for a nut-free plant-based milk, such as unsweetened soy milk or unsweetened rice milk.